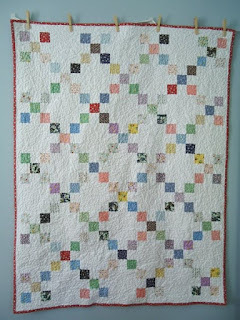 Homespun Stitchworks..... For the love of vintage: Antique Irish chain quilt. a great source of comfort. edged it with antique silk ribbon and it was a perfect size for our kitchen table. To say I am pleased with it is an understatement but the messages I have had over it are vast! It was a lady on my business FB page that asked 'is that an Irish Chain quilt?' in point of fact she asked if it was a double Irish chain quilt... I did not know so I went on the hunt to find out. Indeed it is a double Irish Chain quilt and so I decided to try and find out a bit more about this pattern and its roots of origin, was it of Ireland or just called that. 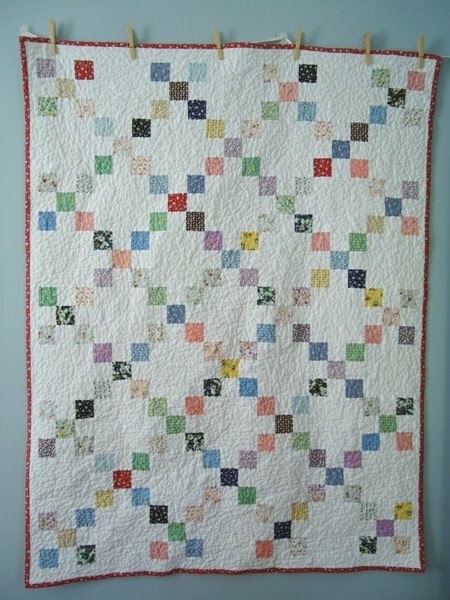 Quilt historian Barbara Brackman, states that 1814 is the earliest known date for this pattern. ... It was brought to America from Ireland and is very similar to this pattern. It is made much like a traditional Single Irish Chain but done on point making the chains appear in the shape of squares rather than diamonds. She goes on to say, Dated examples appear consistently across the decades, indicating the design's popularity throughout the nineteenth and twentieth centuries. done on point making the chains appear in the shape of squares rather than diamonds.
. We find this pattern has been used more recently in Ireland sometimes by the name "Mosaic" or "American Chain". The picture on the right is of a really fine example of a single Irish chain quilt dated 1903. So as you can see there are different theories on it really but I personally believe it came to America from Ireland and is a beautiful pattern. Then I wondered how it was made so I found a great nearly 10 minutes You Tube tutorial on how they are made and It really is a great watch so I thought I would share it with you. It is at the end of this blog if you wish to click on and watch it. I am now inspired to actually make one but I have bought a gorgeous quilt pattern and templates this week and it is called The Winter Star quilt and this will be my winter project this year, January/February when I am not so busy at all so it will keep my out of mischief that is for sure. I do have a three meter never used piece of antique paisley so will see if that will do the job when I have measured and decided on size. Decided I will not do the background like the pattern but continue with the flower shapes but in white only and may do a little embroidery in some... design time will be done soon then I will have all of the Winter to get it hand stitched not be deliberating at all. I have some gorgeous very old monograms and they will be stitched to it as well an S and a A.. of course! Well that is it for today I will leave you with this great tutorial to watch, maybe watch it with your morning coffee you will love it and see it is really very easy I was imagining all sorts of awkward ways of stitching little squares together but no it is very easy. It will be my next lap quilt I think and to be able to buy the white only jelly rolls well I didn't know you could! Yes I could put my own twist to it. I have just ordered the pre cut thick paper hexagons and diamond shapes so that I only have to cut the fabric. I have decided to use an old linen sheet for the white. I am having fun choosing fabrics ..
Then if I get this done in the Winter as a wall hanging I will tackle a single Irish chain one as well. All these plans, lets hope I get the time.